Angels in America is the kind of play that looms large in the consciousness of twentieth century American theatre, but the epic scope which demands incredible feats from its cast and inevitably lengthy run times can make it a tricky sell for theatre companies. Everyone wants it to be done, absolutely- but it's always nice when someone else can produce it, so that you can just go see theirs. 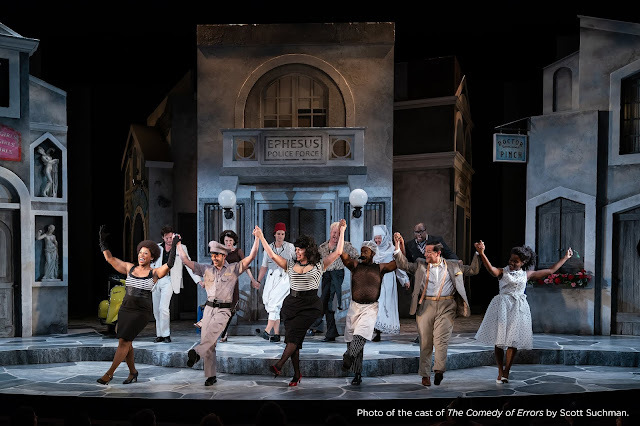 In this case, Round House Theatre and the Olney Theatre Center have combined forces to make the mountain a little more scaleable; each theatre's artistic director helms one half of Tony Kushner's two-part masterpiece, and the two theatres are co-producers of each play. The two plays have their own distinct challenges, but directors Jason Loewith and Ryan Rilette navigate the shared world of the play seamlessly, as Loewith sets the plates spinning with careful art in Millennium Approaches and Rilette reveals their ecstatic, heartwrenching payoffs in Perestroika. James Kronzer's stark, yet expansive set serves both plays well, while Clint Allen's projection designs allow the set to tremble and throb as angelic visitors come nigh. Tom Story's Prior is truly the heart of both plays; his performance is raw and ravaged, but desperately maintaining his dignity as Prior's world unravels bit by bit. Sarah Marshall is a protean wonder, playing more characters than anyone else, and in particular, imbuing Hannah Pitt with an obstinate vitality. Dawn Ursula and Jon Hudson Odom are other strong standouts in a spectacular cast that includes Kimberly Gilbert, Mitchell Hébert, Jonathan Bock, and Thomas Keegan. Angels in America is the type of play that demands to be seen, and you would do well to heed its timely call at Round House.